Saturday was our last day in Portland, and we had grand plans for the day. Dim sum in Chinatown, several hours at Powell’s bookstore, and wandering the Saturday market were all on the slate. We did make it to dim sum at the House of Louie, and I’m not even going to bother with a write up. The Portland Chinatown has suffered the fate of many Chinatowns across the country. 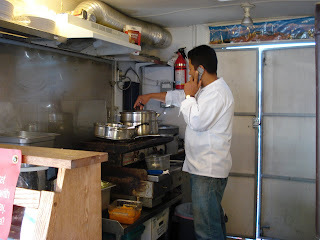 The inhabitants have become more affluent and moved out, and with them the good restaurants. I actually tried to get a cup of tea there, but the owner was nowhere to be found. 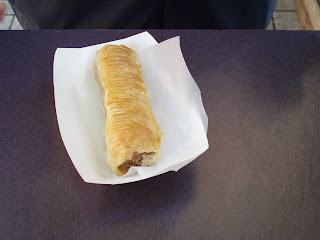 My dad tried a few minutes later and came back with this nice beef and veggie pastie. 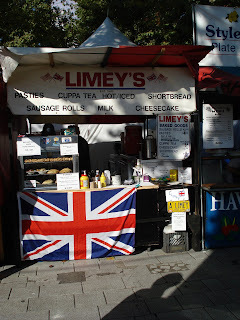 Behind Limey’s was a row of kiosks that immediately caught my eye. Honestly, how often do you find African food next to European next to Himalayan? 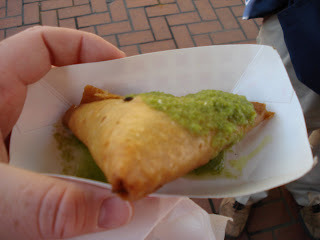 It started simply enough, with a cheap little sambusa. It was a neat little parcel of flavorful chicken, punctuated with a hot green chili sauce. Now I’m not one to complain about heat, I relish the concept of hot food, but this sauce had me going. My mouth was on flame for a good five minutes after, but in a good way. 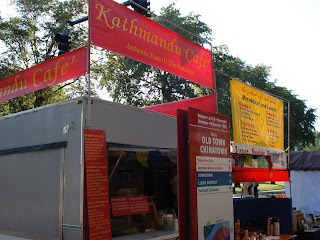 Next up was the Kathmandu Café. I knew I had to try this, mostly because I’ve never had Himalayan food. I settled on the Momos, which were a garlic & ginger dumpling made from Grandma Chancer’s recipe, whoever she is. I didn’t know what to expect from these especially when they were covered with that interesting looking orange sauce, but we were all pleasantly surprised at the flavor. 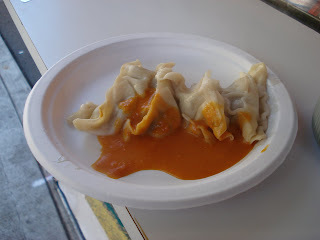 The ginger really shown through in this meat dumpling, and I wish I could tell you more about the dumplings and their origins, but the gentleman who ran the kiosk was too busy to deal with customers. I had really planned to just get some substitutes for breakfast and save room for dim sum, but good plans often go by the wayside. I needed another tidbit, something in the form of a parcel of meat. 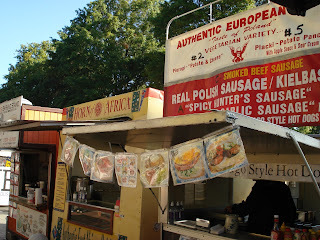 Luckily, the fella that ran the Authentic European Food Kiosk was a talkative one and he lured me over. I knew sausage was too much, but a pierogi would fit the bill nicely. 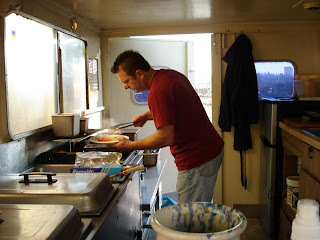 He’s fixing the dish in the above picture. I really only wanted the pierogi but he sold me on the plate. Can you believe that plate of food was under $5? 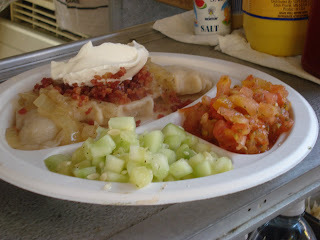 I’m usually more a fan of the fried pierogi, but this was food cart food at its finest. If you’re planning to go to Portland, you really have to make time for the market. Go hungry, just because there will be enough variety to satisfy any discerning taste buds. Word to the wise, go early. If you try to go in the afternoon, the riff raff come out and the market is dominated by smell of patchouli and unwashed hair.